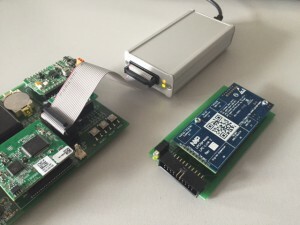 When we took over the development of the EVAL board II for the dLAN® GreenPHY module for the company devolo AG, were we faced with the decision to establish an appropriate debug adapter. Our choice is the LPC-LINK 2 of Embedded Artists, because with a good price-performance ratio excellent integration into the development environment LPCXpresso IDE NXP is given. Different firmware images for the debugger allows the use in other environments with J-Link or CMSIS DAP interface support. However, the original module is unsuitable for our harsh daily lab! The board has no housing and there is an additional adapter for ARM20 JTAG port needed. Therefore we decided to develop a carrier board, which receives the original LPC-LINK-2 module. This board includes the 10- and 20-pin connector adapter and allows the integration into a suitable robust aluminum housing. One challenge was to keep the status LED on the Link2 board outwards … we have found a simple solution by coupling with an optical sensor. An additional bicolor LED indicates the status of the target reset line.